BROOKLYN – New York City has always been a place for firsts and this weekend the Big Apple’s most populous borough will be host to yet another: the inaugural Rock ‘n’ Roll Brooklyn Half Marathon. An incredible atmosphere, filled with live bands amid the bright and beautiful fall colors, is in store for 17,500 runners who will toe the start line early Saturday morning in front of the stunning Soldier’s and Sailor’s Arch at the Grand Army Plaza in Brooklyn’s Prospect Park. Ninety-two-year-old Harriette Thompson, the oldest woman in history to finish a marathon, will be honored at the start by the Leukemia & Lymphoma Society’s Team In Training program. The man who pulled off the course magic in America’s busiest city is New York native Ted Metellus, the Course Operations Director for the Rock ‘n’ Roll Marathon Series. Getting roads closed in New York City is no small feat, and Mettelus has been working hard for months to give the participants the very best Brooklyn running experience. After the start at the Grand Army Plaza, runners will head out and back on Eastern Parkway and Ocean Avenue before finishing at the Nethermead in the center of Prospect Park amid the vivid orange and yellow colors that make this green space one of the most beautiful parts of New York City in the fall. And true to the Rock ‘n’ Roll experience, runners will be encouraged and serenaded along the way with live bands and pom-pom wielding spectators in cheer zones. Following the race Nate Ruess of the Grammy-award-winn ing band, FUN, will perform for all the half-marathoners and their families at the Toyota Rock ‘n’ Roll Concert Series powered by iHeartRadio. Runners from all 50 states and 32 countries will be taking part in Saturday’s “13.1-mile block party.” Hoffman uses the word “epic” to describe what’s in store for them there. For more information about the Rock ‘n’ Roll Brooklyn Half Marathon, please visit the online Race Weekend Information Center at RunRocknRoll.com/Brooklyn. The inaugural Rock ‘n’ Roll Brooklyn Half Marathon will debut on Saturday, October 10, 2015. 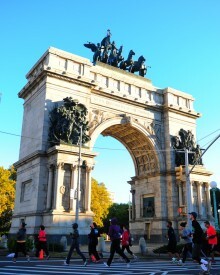 The scenic 13.1-mile course starts at Grand Army Plaza and finishes in Prospect Park. The race concludes with a finish line festival and post-race Toyota Rock ‘n’ Roll Concert Series headlined by Nate Ruess. A two-day Health & Fitness Expo kicks off race weekend on Thursday, October 8 and Friday, October 9 at the Brooklyn Expo Center. The free Expo is open to the public and will feature the latest in running apparel and nutrition products. For more information about Rock ‘n’ Roll Brooklyn, visit RunRocknRoll.com/Brooklyn or follow @RunRocknRoll on Twitter. The Rock ‘n’ Roll Marathon Series is the ‘World’s Largest Running Series’ with more than 600,000 runners taking part in 30 destination events around the world every year. Established in 1998, Rock ‘n’ Roll Marathon Series’ simple idea of making running fun has transformed the U.S. running landscape by infusing the course with live bands, cheer teams and entertaining water stations, creating a block-party atmosphere for participants and spectators alike. Over the 19-year history of the Rock ‘n’ Roll Marathon Series, charity partners have raised more than $310 million through the events for a variety of worthy causes. Race weekend kicks off with a free Health & Fitness Expo showcasing the latest in running gear, sports apparel, health and nutritional information and much more. Events culminate with an entertaining finish line festival and Toyota Concert Series featuring some of the biggest names in music, with past headliners including Macklemore & Ryan Lewis, Aloe Blacc, Pitbull, FloRida and Bret Michaels. Further information about the Rock ‘n’ Roll Marathon Series can be found at RunRocknRoll.com.